Tham Poukham - Blue Lagoon, (7 km west from town, accessible by mountain bike or motorbike). 8AM-6PM. Well signposted, with a number of other sites en route. The toll bridge in town on the way costs 10,000 kip. 10,000 kip more to enter the lagoon/cave site. The lagoon is a small pond, no more than 10m wide, and surrounded by a parking lot, vendors, and tables. On most days, it is plenty crowded, with tourists practically landing on top of each other from the rope swing. Super crowded with Laos families at the weekend, it's a nice spot for a family picnic but hardly an exciting day trip in its own right. There's a water slide - you guessed it, 10,000 kip. The cave above is decent. A modest 100 m climb up rocks and stairs. Once inside, there is a short walk to the Sleeping Golden Buddha and glimmering stalactites about 300 m further inside. Take a head torch or rent one for 10,000 kip, essential if you go deeper into the cave than the Buddha (check the battery in advance). Guides for the cave advertised at 50,000 kip but this is probably negotiable. Guides probably not necessary since the path inside is well worn and marked in spots. Don't fall down the holes towards the back. Padeng cave and Ring cave, (cross a footbridge over the river, follow the signs and white flags (garbage bags) on sticks through the field). Across the river a 1.5 km path marked by white flags cuts through the fields towards the limestone mountains. The smallest hill has very rickety ladders (which can be dangerous) to aid in climbing to the top. Halfway up the mountain is a cave. Another 1 km along the path past the mountain goes through a small forest and arrives at a cave. A few sleepy Laotians guard the cave's entrance and will initially only charge 10,000. However, on exit, they'll shake you down for 50,000 for the guide and 50,000 per lamp. A couple of guys carving reeds with machetes are nearby so negotiation may be difficult. Recommend avoiding. 10,000 kip for the hill, 10,000 kip for the cave, 50,000 kip for the guide, and 50,000 kip per torch..
Xang Cave, (on the south end of the main road. Turn right at the sign to Jam Mee Guesthouse). Decent cave but not worth the 15,000 kip entrance fee plus 2,000 kip per person/3,000 kip per motorbike bridge crossing fee. The cave is well lit and has stairs running throughout that makes it an easy self-guided tour. One part has a really nice view of the farms surrounding the city. If you've been to other caves it's really not worth it. Nang Oua Kham Cave, (On the way to 'Blue Lagoon' turn left after Phone Ngeun village. There is a sign to 'Nang Oua Kham Cave, 8km'. After around 4km you come to an intersection where you turn right. The sign there states it's around another 4km. After about 3km you see third sign where you turn left. The last part is a small dirt road that leads to the ticket stand. Past there you will find some new facilities and the cave.). Well worth the trip it was more adventurous feeling and much more secluded than the one at Blue Lagoon. You might feel the entrance a bit tight at first time but when you get past that most parts are easy to walk. In the end there is mud and water so be prepared with rubber boots or to soil your feet if you want to explore the entire cave. Price includes head lamp. Map cordinates 18°53'55.7"N 102°21'09.3"E. 10,000 kip. 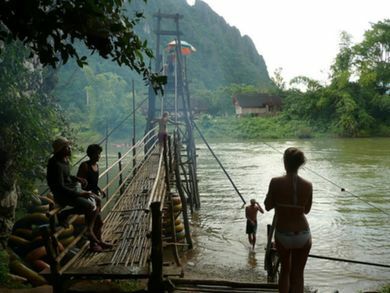 Tubing, (There is an office in downtown Vang Vieng that now monopolizes all tube rentals. They will rent you the tube and organize transportation up the river a few miles.). From around midday to 14:00 is reasonable to go because earlier everyone else would be still asleep. What was probably once a lovely experience has been more or less tainted by hordes of drugged out young foreigners with infected mosquito bites desperately consuming whatever alcohol or drugs can be found. Nowadays there are five bars all congregated at the very beginning of the river and no more swings or slides seem to be up. Some dry bags may not be of the best quality & so cameras can get ruined. To get the deposit back tubes have to be returned by 18:00, but be warned that the place will keep 20,000 kip if you arrive past 6pm. Also DO NOT hand over your tube or ticket without receiving your deposit as the place will take everyone's tickets at once, cash out a few people, and then claim they've "already" given you your money. Generally untrustworthy people all around, probably better just to go down river with your own flotation device you can buy in a nearby shop. Best not to deal with the tuktuk drivers near the last bar if you can help it, either. In winter temperatures fall from 16:00, so start back early. Ride at least one rapid before starting the party to avoid disturbing guests visiting the Organic Farm. You can look at the magnificent view of the mountains rising directly beside the river, but the party scene has taken over and the owners use large loudspeakers, effectively blocking out any singing of birds. Beware of tubes getting stolen while stopping at bars. Tubes get stacked up at each bar so keep an eye on how many are left, especially at the first few bars where lots of people arrive without their own tube. If you're not used to drinking strong alcohol: stick with beer, and for reasons of safety & common sense consider avoiding alcohol if entering the water. The amount of alcohol in buckets can be high, and the effect can kick in suddenly; you won't be the first one to be too drunk to make your way back on the river or to die on the way. During rainy season there is more water in the river and eye infections are common. Also, when you get back to town, please respect the local culture and wear more clothing than your swimming suit or bikinis only. 55000 kip for the Tube + 60,000 kip deposit. Lao-style steam sauna. It's small like a toilet. And like a toilet divided into two parts-for men and women. Pairs with the smell of herbs (lemon grass). Wash under running water on the street. 20.000 kip. Kayaking the river. This covers the same part of the river as tubing (and a more untouched part further upriver). Kayaking trip can include a quite exciting swim on the tube through a cave situated about 15 km from Vang Vieng and lunch. Some of the caves takes more than an hour to walk through, with bats and other animals. A kayaking trip from 9:00 - 16:00 including swim on the tube trough a cave and lunch costs 120,000 kip (feb 2015). Uncle Toms Trails, 2 (located now at Ban Naxou,Kasi,55km north of Vang Vieng town), ☎ 856 (0)2029958903 ([email protected]). Uncle Toms is a dirt bike tour operator offering tours of the beautiful trails around Kasi District. All new bikes, 125cc four stroke trail bikes.geared up to teach total beginners and packages for overnight. Prices are very reasonable,full day training now available with advanced bookings,amazing mountain setting now, please book ahead as only small groups catered for,Kasi is a non touristic town,real Laos..accommodation available and can be included in a package with the training. Rock climbing. There are walls suitable for first timers and professionals. The established climbing outfits in town are Adam's Climbing School (N18° 55.355 E102° 26.784) and GreenDiscovery. A new shop opened in 2012, Central Climbers, managed by seasoned climber Nom. Teach English to rural kids with EEFA, (Phoudindaeng Village, 4km north of downtown; office is located at Vang Vieng Organic Farm), ☎ 020 78008555, . Equal Education For All (EEFA) believes that in order to improve the system we must start by improving it locally. EEFA believes in building from the bottom up one village at a time. Volunteer teachers are always welcome since there is always shortage of teachers. A minimum stay of one month is ideal but if you can only stay for a couple of days, it's better than nothing. Look for Alex at the Vang Vieng Organic Farm or send a message to Equal Education For All on Facebook. 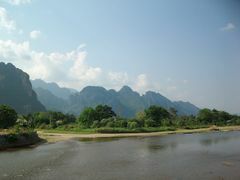 SAELAO Project, (Nathong Village, 7km outside of Vang Vieng, near of Poukham Cave and the Blue Lagoon), ☎ 020 2292-8630, . SAELAO project is trying to set an example of sustainable development for local people. There are different projects including building, organic farming and teaching English to the locals. They are always looking for volunteers, but if you don't have time to volunteer you can visit their restaurant to have lunch & learn about the project. Zipline (Vang Vieng Adrenaline), Tham Nam Cave (10km north of Vang Vieng), ☎ +856 20 5503 3665. Opens 09:00. Newly opened at Tham Nam (The Water Cave) is a western standard series of ziplines. A world away from the ziplines of old at the tubing bars. Set above the Water Cave it offers tourists a chance to venture into the countryside away from the bars. You can visit Elephant Cave & the Water Cave, swim and tube inside the cave and of course soar through the jungle. Mountain Biking. One of the best ways to get around Vang Vieng and the surround villages is by mountain bike. Many outfits in town rent Giant bicycles for around 20,000 kip. There are three main treks to do in the area by bike. The most common is the ride out to Blue Lagoon and back, which goes along a fairly flat (but bumpy) dirt road west of town. Another trek is a 30km flat loop through the villages west of the Nam Song river, which also takes riders past Blue Lagoon and numerous caves. More adventurous riders can take an eastern loop, which goes over rolling hills. Fortunately, all three are extremely scenic. To best guide yourself, purchase the highly detailed "Hobo Map" of Vang Vieng, available at many hostels and guesthouses for around 20,000 kip. Q Bar and Restaurant is now called Milan Pizza, . Food and drinks from as little as £1. Steak+drink for 30,000 kip, curry+drink 15,000 kip. Peeping Som's Bar and Restaurant, Main Rd (just past Wat Kang, next to Chilllao Guesthouse). A small menu offering a change from most other restaurants in town. The Lao chef recommends the Korean BBQ, but also has a nice Korean menu and hotpot (including a vegetarian variant). Lao drinks such as Lao Hai, Flavoured Lao Lao also on offer. Pan's Place Guesthouse, (Pan's Place Resteraunt), (on the main street), Vang Vieng (300 Meters South of the centre), ☎ 023 511484, . 7am - 11pm. Western-style menu, including: All day English Breakfast, Spaghetti Bolognase, Beef Goulash, Cottage Pie, fresh fruit shakes, snacks & drinks. Helpful & friendly staff under Kiwi/Lao management. The Meeting Place, 047 Ban Vieng Kaew (end of the main street, 3 blocks from city centre, beside Laos Haven Hotel & Spa), ☎ +856 23511900. 11am - 10pm. Newly opened restaurant that serves Thai, Lao & Western cuisine. A small, 20-seater establishment. Phad Thai, Spring rolls, Larb and Som Tum(green papaya salad) are their more specialised dishes. USD 3 onwards per pax. The Green Restaurant, (Next to the bamboo bridge toward the island. In front of Aussie Bar), ☎ 020 28 608 030. 6:30am - 11pm. Large menu with western and laos food for decent price. Great for breakfast. Serving can be a bit slow when busy. Great view over the river. 20-50,000 kips (2017). The Kangaroo Sunset Bar, Next to New Bridge, River Road., ☎ +856 20 7714291. Australian and Laos co-owners, excellent service, and they usually give a free cocktail on arrival. Free T-shirts with the name of bar if you buy a cocktail. Free barbeque (mostly vegetable) at evening time. BeerLao is cheapest in town at 15k kip or 10k during happy hour (in shop 10k). Pool table, beer pong, dart board, laughing gas, organized games most nights. Half of all profits are donated to charities and volunteer organizations such as COPE Vientiane and SAELAO Project where co-owner Rhino also volunteers. Gary's Irish bar, ☎ +856 20 7928266 ([email protected]). The only Irish pub in Vang Vieng. Regular live music, 2 free pool tables upstairs and downstairs and 3 TVs showing live sport. Cold beers and homemade pies. However, be warned about the extremely loud music played at night time! Earblugs recommended. Warm Up Bar ("), (down the road from the tubing offices, near the island on the same road as otherside and banana restaraunts), . A new bar in town with a great selection of well made cocktails and free shots with every drink. A great place to hang out before heading to the clubs. Offer a free mojito between 8 and 9 and also have free pool and beer pong tables. Room 101, (On the main road through town. Down a path next to Milan Pizza). Open from midnight on Tuesday, Thursday and Sunday. One of the two clubs in town that alternate the days they are open. Room 101 offers good DJ's playing electro and breaks till the early hours. Viva Vang Vieng, (On the main road through town opposite Room 101). Open on Monday, Wednesday and Saturday. Open on the opposite days to Room 101. Viva offers commercial dance music through the night. Big dance floor, inside and outside bars and a pool table. Has free beer inside and free whiskey drinks outside from 9 to 11 pm. Jungle Project, (2km outside of town. Free tuk-tuks available from town centre). Open every Friday from 10pm. A big outdoors party with similar music to Room 101. Gets busy after midnight with fire show from 1am. 30,000k entrance charge. Smile Beach Bar, (On the island, entrance opposite Aussie Bar.). Beach bar with fruit shakes, great burgers and drinks. Chill-out music during the day, with hammocks, free stationary tubing, volleyball and petanque. Pop/dance music by night with a dance floor and a large campfire. Bee Bee Guest House. Full of great character just nearing the end of the main bar street. Rooms are clean and spacious and the family that runs this guesthouse speaks English and are always ready to help. Free WiFi, all rooms have hot showers en suite, drinking water and supplies tourist information. Great roof views from the balconies, safe rooms and great price.Really nice people and staff. Approximately 20 minute walk from the center. The neighboaring Karaoke is guaranteed to put a smile on your face - up to the moment you realise that is was not just one Chinese/Lao 'artist' that sings thát off-tune - it's all of them. Luckily, the abondance of noise seems to kill shortly after 10pm, after which a quiet night should be possible untill the first enthousiasts start off-singing again some time after lunch. Babylon Guest House, . An established inimitable accommodation that's either loved or not. Being in the centre of town at the start of the main bar street many characterful guest enjoy the accommodation. With free wifi and internet for guest and a downstairs bar & organic restaurant. Politically incorrect jokes are a must and English speaking staff are helpful. All rooms have hot showers en suite. Great roof terrace views. Champa Lao Bungalow. Cheap huts on the island down stairs with river view. 100,000 kip. Friendly local family and traditional-style rooms. Mountain view from the wooden porch with hammocks upstairs cost 40,000-70,000 kip. Breakfast included, tasty food and free wifi. Champa Lao Villa. Nice garden, tasty food, nice rooms. Breakfast included and free wifi. rooms 60,000-80,000 kip and also family rooms priced at around 250,000-200,000 kip. Chillao, (On the main road north of Q Bar), ☎ +856 23 511 328 ([email protected]). checkout: 12pm. Centrally located, social hostel offering dorms and some of the cheapest single rooms in Vang Vieng. Adequately clean despite the rather unorthodox plumbing, dorm rooms have broken lockers, free wifi, free tea and coffee. June 2015: this guesthouse is currently under construction. May 2017: 40,000 kips for a bed in dorm & 100,000 kips for a private room. free breakfast between 7-10 a.m. (omelette, pancake, banana, baguette, jam, butter, coffee and tea) and free Lao whiskey after 17.30 until when a dozen of bottles finish. Dokboua Guesthouse, (In fromt of BCEL bank). Clean nice rooms. Free Wi-Fi in rooms. Free coffee and tea. Double fan room with private bathroom 80,000 kip (Jan 2018). from 60,000. The Elephant Crossing Hotel, . Small hotel. All the rooms have a view of the river, with a restaurant right next to the river. Good selection of food and beer, free wifi. US$30-50. Greenview Bungalows and Restaurant, ☎ +856 20 212 8086, +856 20 501 1679. Just across the road from the Phoudindeng Organic farm. Khamsone and his wife Some offer comfortable clean bungalows with hot showers, great Lao food, and occasional campfires and singalongs. A great place to escape the noise of downtown. Bicycle and motorbike rentals are available. Bungalows with double beds 70,000 kip, other double rooms for 40,000 kip..
Island bar. Great view over the mountains from the restaurant. Midrange. Grumpy owner. Lucky Guest House. Great view over the mountains from the huts. Cheap huts on the Island. Friendly local family. Nam Song Garden. Lao born Malay's and Norwegian Arne's place. Great view over the mountains from the shaded garden. Fan rooms and bungalows from 40,000 kip. May 2017: 80,000 kips for a fan room. Free 24-hour wifi, towel, water refill, metal lock-boxes. Book exchange. Nana Guest House, (at the south end of the main street). 3 story, simple guest house. Friendly family-run staff, hot showers, a fourth-story balcony and laundry. Good for sleeping away from the raucousness further north. Pans Place Guesthouse, (on the main street). Clean rooms in a quiet location, 300 m from the centre of town and 200 m from the river. Restaurant open from 7AM till late, snacks and meals, internet cafe, with discount rates for guests. TV room with cable TV and DVDs, Communal balcony with views of the mountains and sunsets, Laundry service, free drinking water, All rooms have fans, comfortable beds and are mosquito-proofed. Sengkeo Guesthouse, (South end of town a block past Wat Si Sou Mang). Family-run guesthouse, nice and quiet (roosters rather than techno) and chill atmosphere, wifi, hot water and tea station. A ranch-style row of nice, basic rooms facing a lovely garden. One person staying in a fan-cooled room with two twin beds, ensuite bathroom was 87,000 kip in Jan 2018. ". Sengdeuan Guest House, (just past the Kangaroo Sunset bar), ☎ +856 23 511138. checkout: 12 noon. All rooms come with towels, soap, bottled water & toilet paper included. The private pool in the garden has water in it from Feb-Nov. A great place to learn about the history of the area and the Hmong people. Fan rooms with own bathroom s/d 40,000/50,000 kip. Air-con 90,000 kip. Villa Vang Vieng Riverside, (Near the Kangaroo Sunset bar and the toll bridge), ☎ +856 23 511460 ([email protected]), . Located directly at the river, with a great view. Buildings and rooms are designed in Lao style. Fast, free wifi. US$30-US$50, incl. breakfast. Le Jardin Organique. Away from the party in a nice location with lovely looking rooms. Hot water doesn't get hot and some find the owners are difficult to deal with. $US18 per night for bungalows with hot water. Domon Guesthouse, (Beside River). Nice enough double room worth the extra money. Views from the balcony onto the river and towards the mountains are stunning, especially at sunset. 60,000 kip. Chanhthala Guest House. checkout: 11.30. Free wifi with towel and soap 25,000-50,000 kip. Laos Haven Hotel & Spa, 047 Ban Vieng Kaew, Formerly Tony's GH (end of the main street, 3 blocks from city centre), ☎ +856 23511900, . Looks gorgeous from the outside but don't let that scare you away, reasonable prices with very clean basic rooms. Peaceful, quiet location just 5 minutes walk from the "center" of town where the bulk of the restaurants are. The family running the hotel speak very good English, and are very friendly and helpful. Booking of bus tickets, kayaking and other adventure tours through the manager may be cheaper than some other hotels/agents. Offers Spa facilities. Riverside Backpackers Guesthouse, (On the island). checkout: 11:00. Located on the island, guesthouse has a nice big rooms. Rock Backpacker Hostel. New budget hostel (January 2017). There are mixed and female only dorms with (very nice) shared bathrooms and private rooms with attached bathrooms. All rooms include breakfast (omelette, fried or scrambled eggs or jam & butter with bread, bananas, hot drinks). It is a bit north of Peeping Som's on the main road. Its comfort level and facilities are very similar to a nice European hostel. The bar has a pool table and lots of games, however, the drinks are pricey (big bottle of beerlao for 15,000 kip). dorm from 5 USD. Many Guesthouse. Big double room with en suite shower and balcony with stunning mountain view next to smile beach bar and across the river from the green restaurant price updated 2018 100,000.